Art in the Garden at Sir Harold Hillier Gardens is now in its 14th year. Billed as one of the most exciting exhibitions of outdoor contemporary art and sculpture in the UK it doesn’t disappoint. Scattered all over the beautiful gardens are works from both new and established artists. At home at the pond edge or taking pride of place outside Jermyn’s House the pieces range from small to large, elegant to quirky. It’s not all at eye level either – keep your eyes peeled for plant pot spheres in a large oak tree near the Visitor Pavilion. The quirky piece of art is called Hybrid Infusions and is by Taz Lovejoy. Although artists from all over the country are represented, Hampshire artists are making their mark. 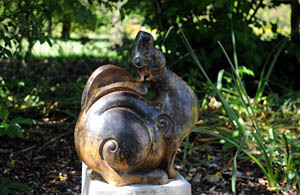 Garden sculptor Paul Harvey has two pieces: Terns – a pair of terns made from reconstituted marble, and Hare – a very sweet, round looking hare made from cold cast mixed metals. They can also be found near the Visitor Pavilion. If you like his art you are in good company – he has sold to the royal family. Paul’s studio is in the countryside and is home to many of the birds he sculpts. The aerodynamic lines of his avian subjects are interpreted through much of his work with an art deco feel. 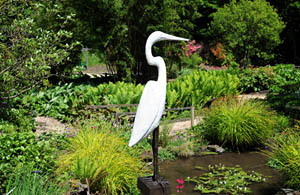 Juliet Scott is showing Eddie the Egret – an elegant white statue made from bronze and marble resin which can be found not far from the Bog Garden, and The Wedding Guest – a striking female figure in bronze resin found outside Jermyn’s House. At almost life size, you can’t miss this lovely piece. Juliet’s passion for elegant lines and curves is evident. The artist studied for several years under internationally renowned sculptor Les Johnson and now works mainly in clay. 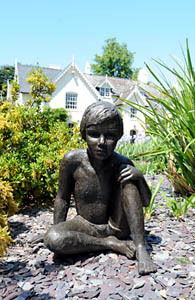 The work of Jenny Wynne-Jones can also be found in front of the house. She is exhibiting Toby and Marisa. Toby is a charming young boy sat in a patch of slate in the border. He is cast in bronze resin. Marisa is in the same border, also sitting, with eyes cast downwards. Jenny studied at Portsmouth College of Art and is now a full time artist. Her work is mainly modelled on friends and family. Art in the Garden is on until Sunday 20th October and is free with normal admission.